Coleraine ( from Irish Cúil Rathain, meaning "nook of the ferns" [ku?l? ???ah?n? is a large town and civil parish near the mouth of the River Bann in County Londonderry, Northern Ireland. It is 55 miles (88.5 km) northwest of Belfast and 30 miles (48.3 km) east of Derry, both of which are linked by major roads and railway connections. Coleraine has a long history of settlement. The Mesolithic site at Mount Sandel, which dates from approximately 5935 BC is some of the earliest evidence of human settlement in Ireland. The Tripartite Life of Saint Patrick records how the town got its name. When Patrick arrived in the neighbourhood, he was received with great honour and hospitality by the local chieftain, Nadslua, who offered him a piece of ground on which to build a church. The spot was next to the river Bann and was overgrown with ferns, which were being burned by some boys to amuse themselves. This incident led to the area being called Cúil Raithin ("nook of ferns"), which was later anglicised as Colrain, Colerain and Coleraine. It was translated by Colgan into Latin as Secessus Filicis. 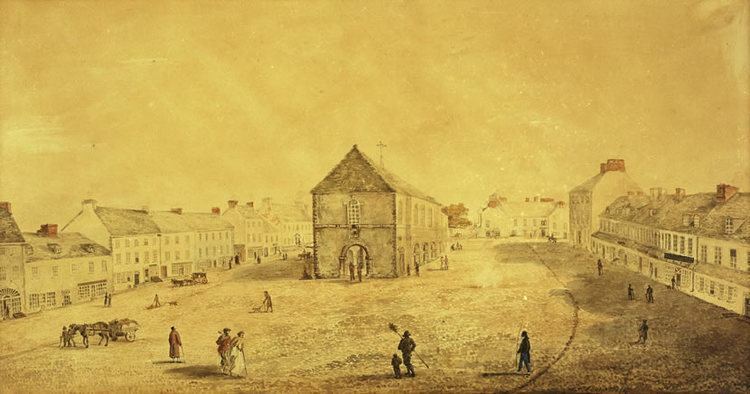 The town was one of the two urban communities developed by the London Companies in County Londonderry (hence, Londonderry) in the Plantation of Ulster at the start of the 17th century. The slightly skewed street pattern of Coleraines town centre is legacy of that early exercise in town planning, along with traces of the lines of the ramparts that provided the Plantation town with its defences. In 1637 the Surveyor General of Customs issued a report compiled from accounts of customs due from each port and their "subsidiary creeks". Of the Ulster ports on the list, Carrickfergus was first, followed by Bangor, Donaghadee, and Strangford. Carlingford and Coleraine each had £244 customs due and had equal ranking. With some industrialisation, the expansion of the river port, and the development of the railway, the town expanded significantly throughout the 19th century and into the early part of the 20th century. Coleraine steadily expanded after the Second World War. The population doubled due to major industrial development on extensive suburban sites, the decision to site the New University of Ulster (now known as the University of Ulster) in the town, the expansion of commerce and the development of sporting and recreational facilities. There has been a steady expansion of the urban area from the mid 20th century compact town of less than 1¼ square miles (2 km²), to the present much more dispersed town of about 7 square miles (11 km²). During the Northern Irish Troubles 13 people were killed in or near Coleraine, ten of them in two separate car bomb explosions. Since 1980 growth has continued but at a slightly more modest pace. In the twenty years to 2001 the towns population increased by 22% to approximately 25,000 but the rate of increase fell from 12% in the 1980s to 8% in the 1990s. 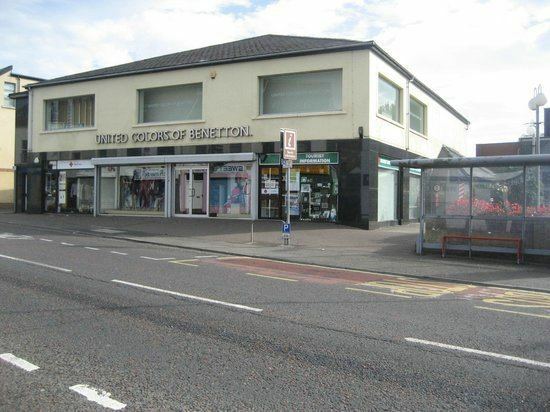 Coleraine is the main town of the world famous Causeway Coast, which attracts over three million visitors per year, spending in excess of £37 million. The world famous Giants Causeway is a twenty–five-minute bus ride away. The distillery village of Bushmills is well-served by buses from the town and there is a narrow-gauge steam train running in the summer from Bushmills to the Giants Causeway. The train journey takes approximately fifteen minutes from the town to the Causeway. Also north of Coleraine is the scenic coastal town of Portstewart, with fine sandy beach and coastal walks. Portrush is part of the Borough. North-west of Coleraine lies the small village of Castlerock, with a beach which is essentially a continuation of the beach at Portstewart, separated by the River Bann. Also nearby is the huge beach at Benone Strand and Mussenden Temple, built by Frederick Augustus Hervey, an 18th-century Anglican bishop atop a precipitate cliff and overlooking County Donegal in one direction and Scotland in another. The National Trust managed Downhill forest was part of the Bishops Palace, and although the Palace itself is now a ruin the gardens are a wonderful place full of strange hidden lakes and gloriously tended flower gardens.